I’m not really interested in giving people a quick introduction; I tend to mix my personal life, humour, sarcasm and knowledge into my book reviews and blog posts. However I do want to kick off talking about the book that turned me into a reader. It wasn’t until 2009 that I discovered the joys of books and reading and something inside me clicked and I wanted to consume every book I saw. This life changing event was all because of one book, an Australian non-fiction title called Hey! Nietzsche! Leave Them Kids Alone! by Craig Schuftan. At the time I listened to a lot of music and would have cited AFI, My Chemical Romance, Weezer, and so on as some of my favourite bands. In face I was right into the music that was been played on Triple J. Craig Schuftan was a radio producer at Triple J at the time and there was a short show he made for the station called The Culture Club. In this show he would talk about the connection rock and roll has to art and literary worlds. Friedrich Nietzsche was claiming, “I am no man, I am dynamite” well before AC/DC’s song TNT. That was a real revelation for me and I picked up Hey! Nietzsche! Leave Them Kids Alone! 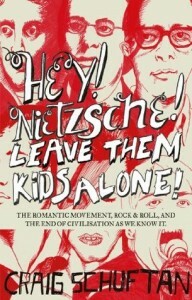 (subtitled; The Romantic Movement, Rock and Roll, and the End of Civilisation as We Know It) and began reading it. However it didn’t stop there; this book connected the so called ‘emo’ movement with The Romantic Movement, I never thought these bands would have anything in common with the greats like Lord Byron, Percy Bysshe Shelley or John Keats but I had to find out. Hey! Nietzsche! Leave Them Kids Alone! by Craig Schuftan ended up taking half a year to complete; not because I was a slow reader but I wanted to know more,and I read poetry by Lord Byron, Percy Bysshe Shelley and John Keats, and researched online. I picked up books like Frankenstein (an obsession of mine), Dracula and Wuthering Heights just because they were mentioned. This was a weird turn in my life but my growing thirst for knowledge became an obsession with reading. I have now set a life goal to read everything on the 1001 Books you must read before you die list. It is weird to think one book can have such a huge impact on my life but I credit Craig Schuftan (and my wife) for such a positive improvement in my life. I will eventually read Craig Schuftan’s books The Culture Club: Modern Art, Rock and Roll and other stuff your parents warned you about and Entertain Us! : The Rise and Fall of Alternative Rock in the Nineties but I’ve put them off because I suspect the same amount of research will be involved. Has a book had such a positive impact in your life? I would love to know in the comments. Also are there any other books that explore the connections between art and literature with pop-culture?